New : our very BEST and the most luxurious dark burgundy velvet Christmas stocking with a faux fox fur cuff. You cannot find this stocking anywhere else! This heirloom Christmas stocking was designed in our European studio since we could not find any such stocking made anywhere in the world. We wanted to offer a stocking that would be exactly like the most luxurious velvet Santa suit trimmed in the soft high quality fur. 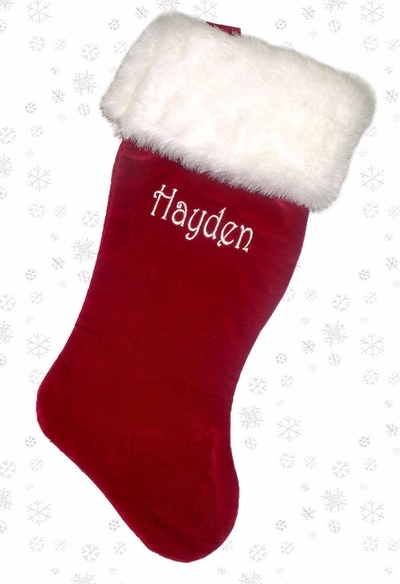 This stocking is the largest one we carry so there is plenty room for stocking stuffers. We have manufactured only 2,000 of these for the season and they will sell out quickly... so if you like this Christmas Stocking, place your order now before they are sold out. This stocking should retail for over $50 but we wanted to make a finest luxury affordable so you can have a true heirloom quality Christmas stocking at a great price! The burgundy velvet stocking measures 21" long along the diagonal from the top of the cuff to the toe; and the width across the cuff is 8 and 1/4". The luxurious and soft white faux fox fur on the cuff of the stocking was hand selected to provide the true touch and feel of the most luxurious holiday decoration. This stocking will become a cherished family heirloom. Embroidered with Gold Metallic Thread - ONE WORD ONLY Embroidered with Silver Metallic Thread - ONE WORD ONLY Choice of fonts: Embroidery Script or Embroidery Block We have a sample picture of the stocking monogrammed with silver metallic embroidery thread ... click on the thumbnail image in the top right hand corner of this page to see a larger version.